The NHS sites the three prominent symptoms of Parkinson’s as being ‘an involuntary shaking of particular parts of the body (tremor), slow movement, as well as stiff and inflexible muscles’. From these main indicators spring a multitude of further complications – physical and psychological – which can have a detrimental effect on lifestyle of both the person living with the condition, and their families. I have seen first hand how tai chi (and a positive mental attitude) can help with Parkinson’s and this article is formulated from an interview with one of my students who lives with the condition. It is based on her experiences, and I back these up with solid medical research. Tai Chi is a Chinese martial art, and my usual response to this question is “…you know, the one that’s performed really slowly”. Most people have heard of tai chi, they know that it’s supposed to be good for health and wellbeing, and they have seen pictures of people across parks in Asia performing it early in the mornings. Quite often they do not realise that the slow, graceful movements are part of an intricate and effective martial art, which in China is held in the highest regard, hence the direct translation of Tai Chi Chuan being “Grand Ultimate Style”. Over recent years, I believe that it is fair to say the health benefits have been promoted more than the martial elements of the style – which is at the same time both a shame and a positive. Without it being heralded as a tremendous healing art it may not have spread into the public consciousness as it has – but at the same time, for traditionalists, losing the martial element has ‘taken the teeth out of the tiger’, as they say. Personally I think that it’s neither good nor bad – as long as certain principles are upheld, tai chi is whatever you want it to be – if you want to learn it as a martial art, or as a healing art, or anywhere in between, find an instructor and a style that suits you best. I first met Norma a couple of years ago when she contacted an alternative healthcare centre I was working in at the time. We met and after hearing of her condition and the symptoms, I immediately felt as though I could help with a tai chi based training programme. I believe that the symptoms can be different for everyone but reflecting back to two years ago Norma recently told me about her initial diagnosis and what the signs were of her having Parkinson’s. Needless to say, with such a list of signs and symptoms, Parkinson’s is a condition which can be hugely life changing. Despite this, a positive mental attitude – which Norma exemplifies – goes a long way to help with keeping the condition at bay. Obviously medication is going to help as well – and it is beyond the scope of this blog post (and my knowledge!) to comment or offer advice on medication – but what I do know for sure is how much progress Norma has made in two years of regular tai chi and qigong practice. I asked Norma to comment on how she felt tai chi had helped her over the last couple of years, and what differences she, as well as those closest to her, had noticed, as well as how other people had perceived changes in her since starting a regular practice. Not being able to think of anything other than the move I am trying to do doesn’t frustrate me but has the opposite effect and calms me. Increased mobility in walking and muscle, joint, limb movement. What is particularly pleasing, and what should offer hope for those diagnosed with Parkinson’s, is the amount of benefits that you can gain just by a little bit of daily tai chi practice. The physical improvements in balance, posture, muscle and joint mobility, all have a tremendously important knock on effect in increasing confidence, sociability, sense of humour and an overall feeling of wellbeing, whilst reducing levels of stress and anxiety. With such improvements, those with Parkinson’s can lead a life which is not held hostage to a health condition, and not allow it to define who they are as a person…… now that’s what I call real self defence! In 2012 the New England Journal of Medicine reported findings from a study in which participants with Parkinson’s practiced tai chi twice weekly, their progress was compared to two other groups, one following stretching routines and another strength/resistance based training. It was found that the tai chi group performed better at balancing than the stretching group and directional control and walking was better compared to the group focussed on resistance training. Backed up by research and first hand testimonials, tai chi clearly offers a lot of benefits to those living with Parkinson’s, helping to increase quality of life and keep the effects of the condition at bay. 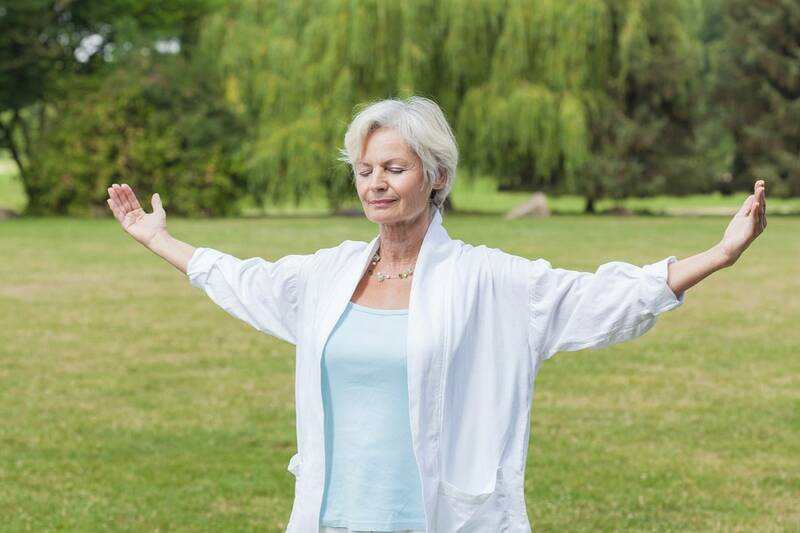 Medical experts show that the practice helps with balance and posture – and these have a tremendous impact on the quality of life of the tai chi student with Parkinson’s. The list of improvements which Norma reports, first hand, show just how transformational learning (and importantly practicing) tai chi can be. She has progressed tremendously and is now learning tai chi weapons – the fan and cane. I think we should also realise that the social element of belonging to a community of like-minded people is also hugely important. The effects of Parkinson’s can be detrimental to confidence to the point of not wanting to be sociable but learning and improving, amongst friends and training partners, can give your confidence a real boost – with the knock on effect of improving your social life (and quality of life!). It’s easy to learn the basics of tai chi and start reaping the rewards, with just a little practice and patience. The great thing is, as the benefits of tai chi are becoming more well known, new classes are popping up all of the time. It’s worthwhile checking a few out before deciding on which style and instructor is the right one for you. 0 responses on "Parkinson's and Tai Chi"